Led Zeppelin Masters frontman Vince Contarino performing at Newcastle City Hall. Pic: Mick Burgess. They sold an estimated 300 million albums and smashed box office attendance records, as well as inspiring generations of rock bands that followed in their wake. Led Zeppelin Masters are as near to the heavy rock legends as fans get these days. Pic: Mick Burgess. Following the tragic death of drummer John Bonham in 1979, it all came to a crashing end. Save for an appearance at Live Aid and a special show at London's O2 in 2007 which saw 20 million people scramble for tickets, the chances of seeing them live again are somewhere between nil and not a chance. The clamour for all things Zeppelin remains undiminished after all these years, so it was no surprise to see a healthy turn out at Newcastle City Hall on Friday night for a show by Led Zeppelin Masters. And having travelled all the way from Australia, joining up with a 35-piece Black Dog Orchestra on the way, this was never going to be a show of half measures. Led Zeppelin Masters in action at Newcastle City Hall. Pic: Mick Burgess. Opening with an impressive atmospheric orchestral medley incorporating elements of Kashmir and Stairway To Heaven set the scene for the bombastic opener Good Times Bad Times and Nobody's Fault But Mine. 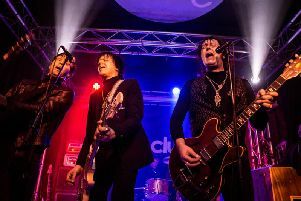 Frontman Vince Contarino, who had been struggling with a throat infection that caused the cancellation of the previous show in Cardiff, battled on with Over The Hills and Ramble On. Robert Plant`s vocals are tough to tackle at the best of times as Contarino joked that he'd have been better off singing two hours of Johnny Cash. All Of My Love saw the band and orchestra combine beautifully before the ominous bass rumblings of Dazed And Confused and a barnstorming Rock And Roll brought the first section to a thunderous close. Whatever Contarino had taken during the interval should be made available on the NHS, with a performance that went from pretty decent but struggling at times to 'wow!'. Kashmir was outstanding, with Contarino capturing Robert Plant`s mood to perfection, while the orchestration was simply stunning, as too was Stairway To Heaven. It may well be an overplayed classic, banned in guitar shops the world over, but seeing it performed live with an orchestra was a truly majestic experience. Where on earth can you go after playing one of the all-time classics? Well, Heartbreaker, the titanic groove of Black Dog, a thumpingly-heavy Immigrant Song and the iconic riff of Whole Lotta Love did just the trick in getting the whole crowd up onto their feet. It may not have been the real thing, but Led Zeppelin Masters certainly gave Newcastle a trip down memory lane for many and an insight into the power of Led Zeppelin's music live for those too young to have seen them at their peak. A cracking evening of classic music.